By default, Magento includes only a single inventory per product, which is a bump for stores relying on several warehouses. 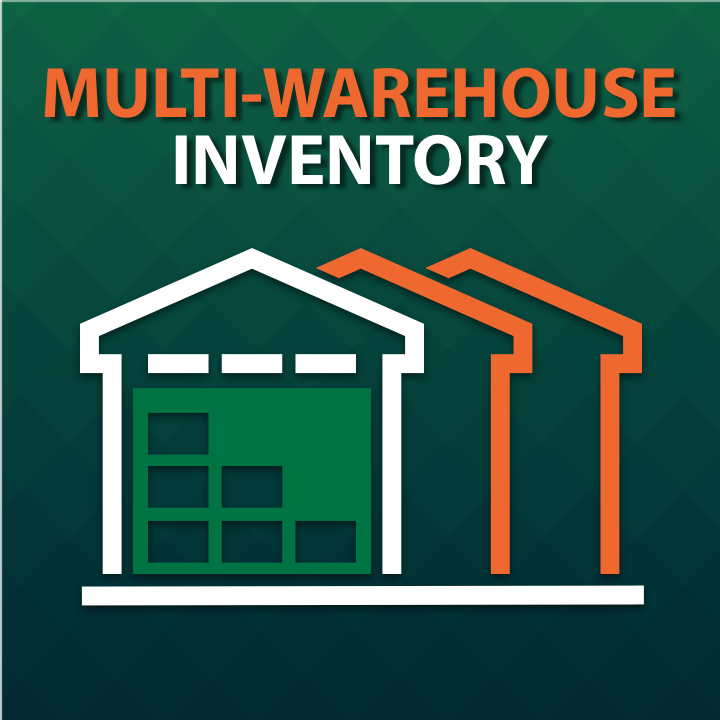 The extension is designed to create unlimited number of warehouses and assign separate inventory to each product. 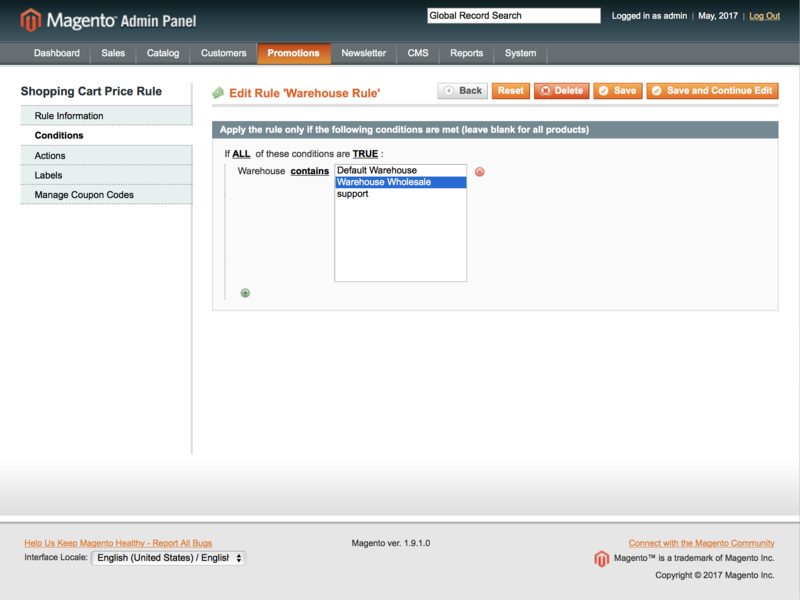 The module also provides great opportunities to create rules to select appropriate warehouses for purchased products. Among them: by priority, by country, by category, by product type, etc. Admin can set any set of rules! It is flexible enough to allow one or multi-warehouse order. The extension fully supports all Magento processing stages, namely checkout, submitting / editing / canceling / refunding of orders, export / import, reports, API. 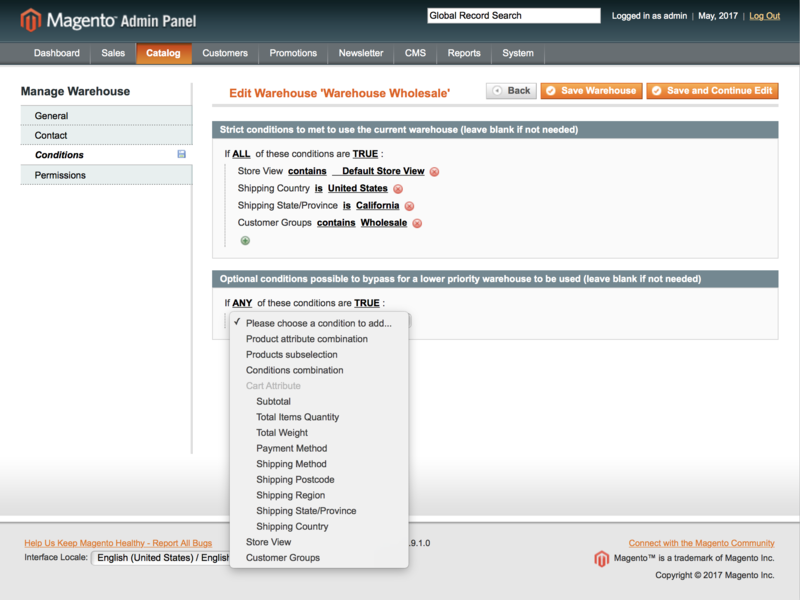 While installing, the extension automatically creates a Default Warehouse that stores all products’ stocks. • Optional conditions possible to bypass for a lower priority warehouse to be used. On the 'Conditions' tab, an admin user is free to create whatever combination of conditions based on Store View, Customer Groups, Shipping Country / State / Region / Postcode, Payment Method, Shipping Method, Total Weight/Qty/Price, and any Product Attribute Combination. On order submission, a priority is given to a warehouse which best meets the following conditions: Strict Conditions > Optional Conditions > Priority > Qty (in descending order). 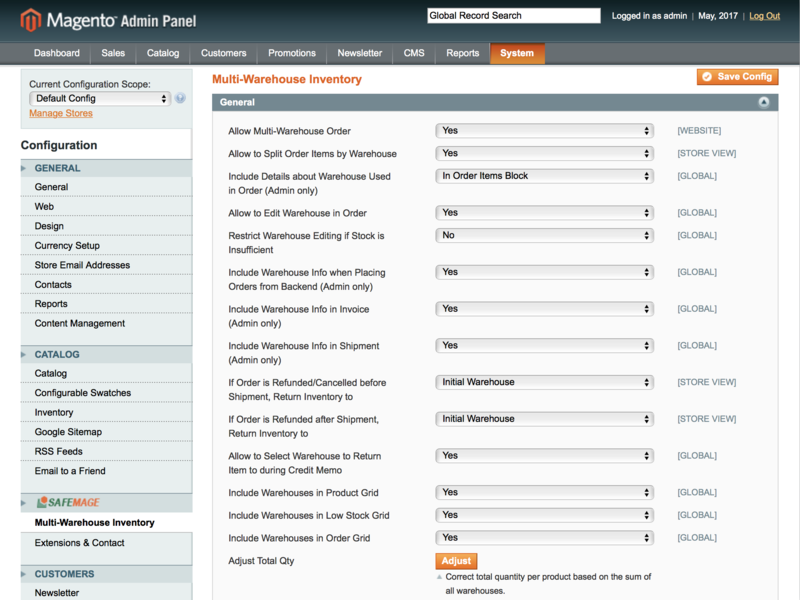 Allow Multi-Warehouse Order = Yes - enables to create an order that includes more than one warehouse. 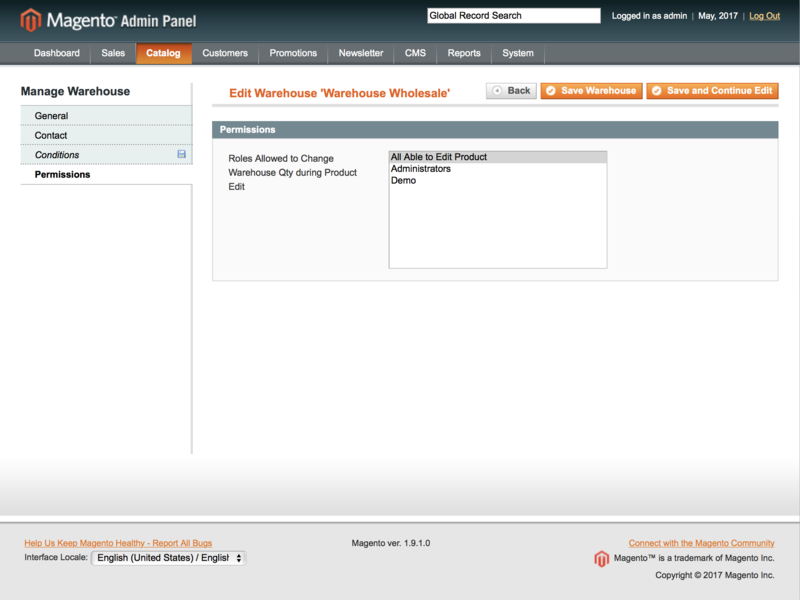 Allow to Edit Warehouse in Order = Yes - enables admin user to manually edit warehouse in existing orders. 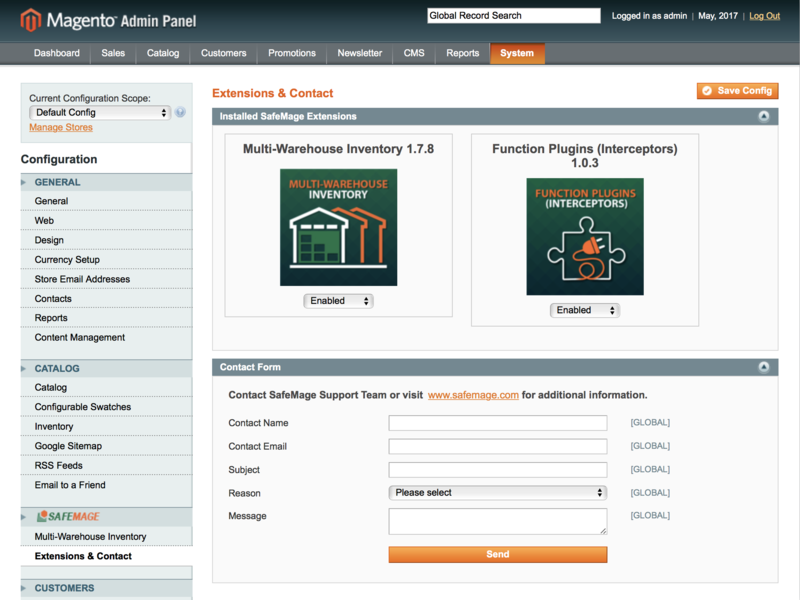 In can you'd like to prevent warehouse stock updates by a specific category of admin users, you can create a respective Permissions Role. This will apply to the aforementioned aproaches to manipulate warehouse stock. Should you have and questions or wish to request an extension’s quick customization, just drop a line. Your case will be processed within a day. 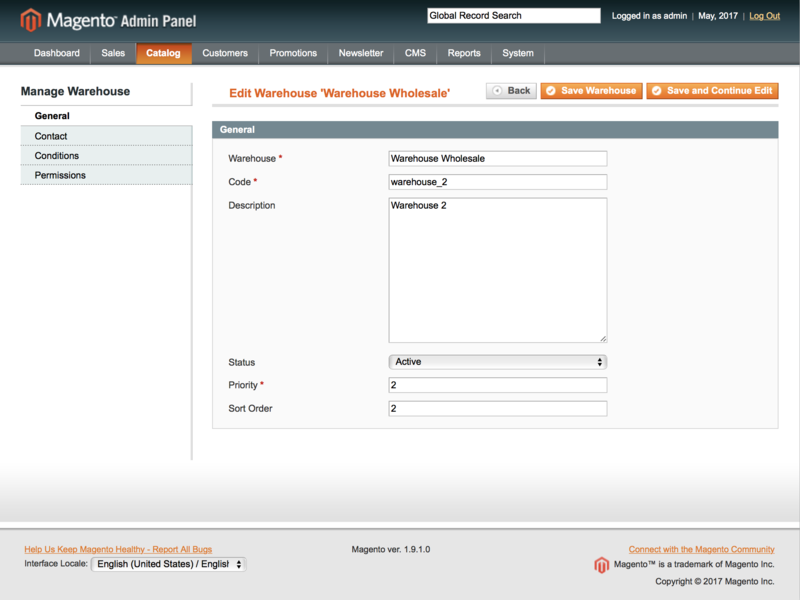 Added support for a warehouse variable in order emails. Added a new setting to 'Send Order Confirmation to Warehouse Contact Email'. Added a new 'Use Shipping Origin from Warehouse Contact' setting. Improved support for SOAP v2. Addressed an issue with warehouse grid occurred after the 1.9.0 release. Added a new ‘Edit Warehouse Qty in Product Grid’ setting. Added support for SOAP V2 API methods. Addressed an issue affecting new customers when there is a warehouse with no stock allocated to it. Addressed errors appearing in log files. Addressed an issue occuring when 'rule_apply_all' cron is run. 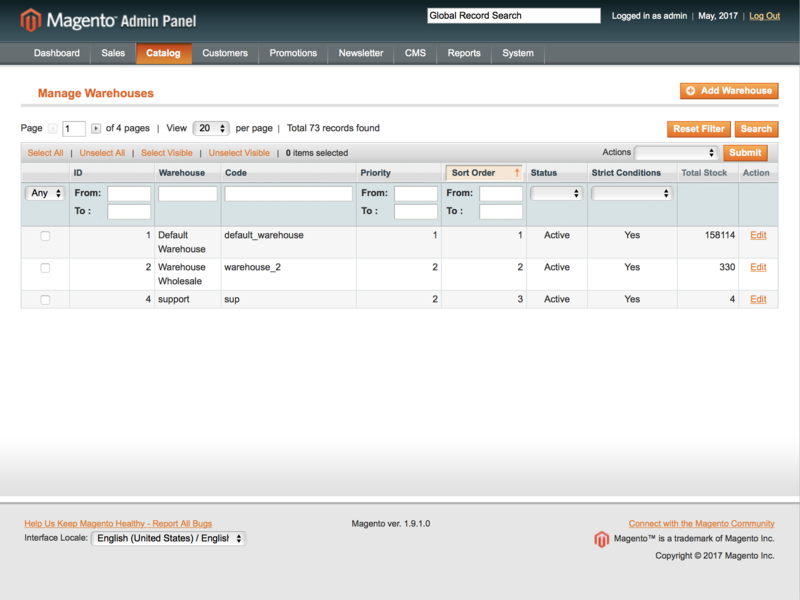 Added support for the backorder functionality. 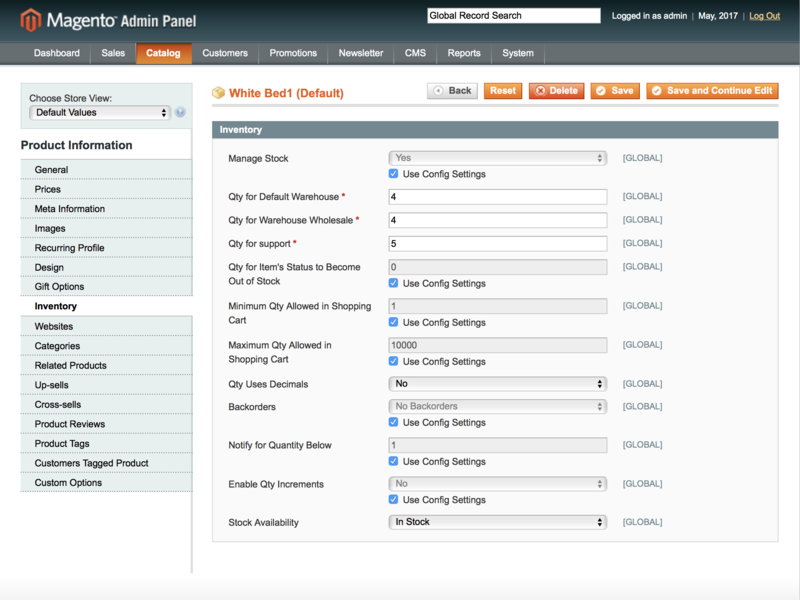 Addressed an issue with reindex on Magento Commerce (EE). Added Indexer by store view. Added simple methods to save warehouses programmatically. Addressed an issue with reindex of bundle products. Addressed an issue with availability of bundle products. Addressed an issue with configurable product's disabled associated items. Addressed an issue with the availability status of Grouped products after reindex. Addressed a display issue with cart items split by warehouse. Addressed a minor issue with stock adjustments after canceling an order. Addressed a minor issue with stock adjustments after refund. Addressed an issue with partial refunds. Addressed a minor issue with orders created from backend. Added check of strict conditions on product page. Addressed Availability setting update on stock change. 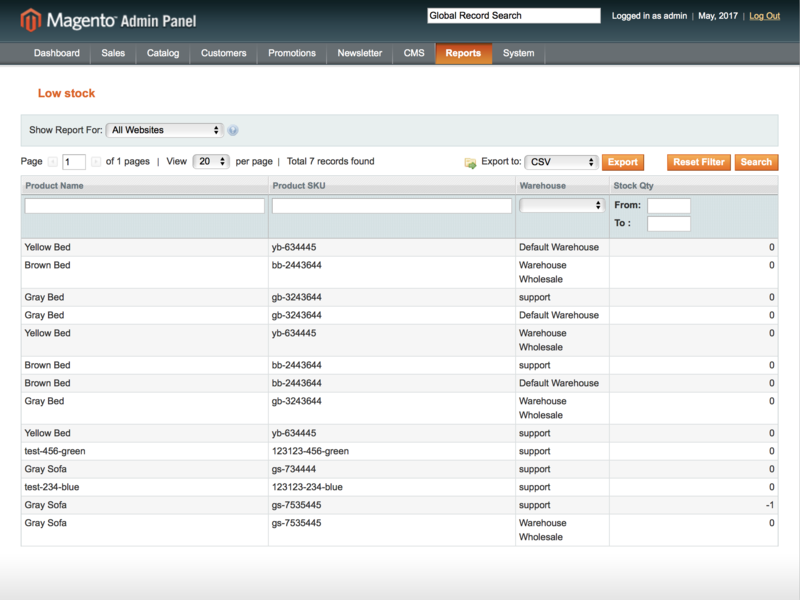 Added ability to move product inventory between warehouses on the products grid page via the mass action menu. 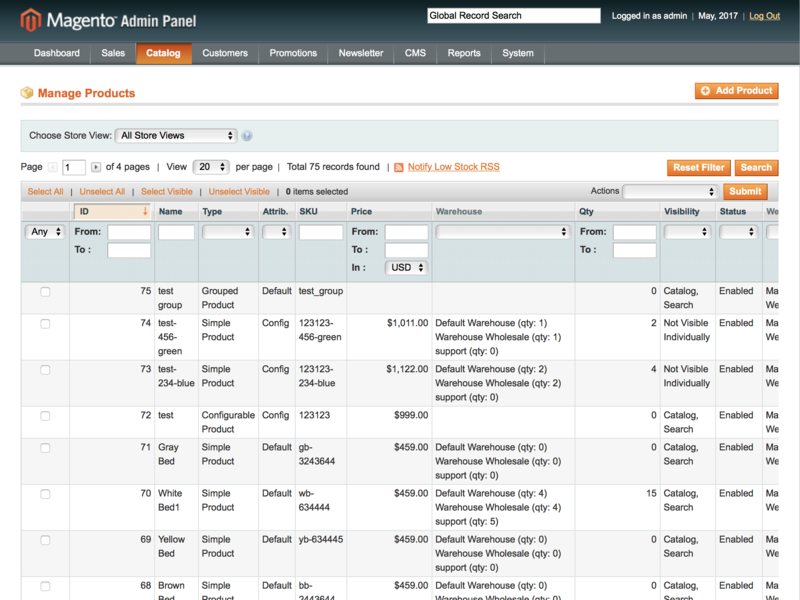 Adjusted stock quantity display for configurable, grouped and bundle products on products grid. 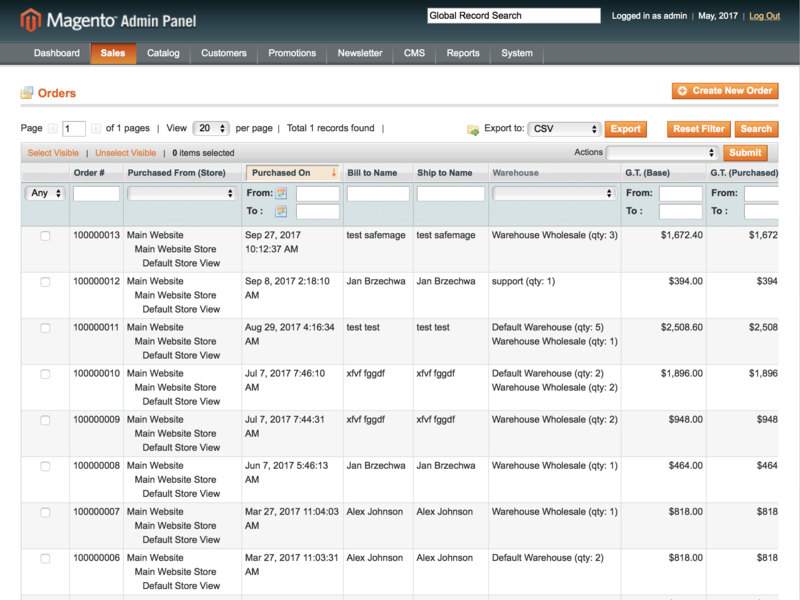 Added ability to include warehouse information in invoices and shipments. Fixed an issue with collect qty totals. 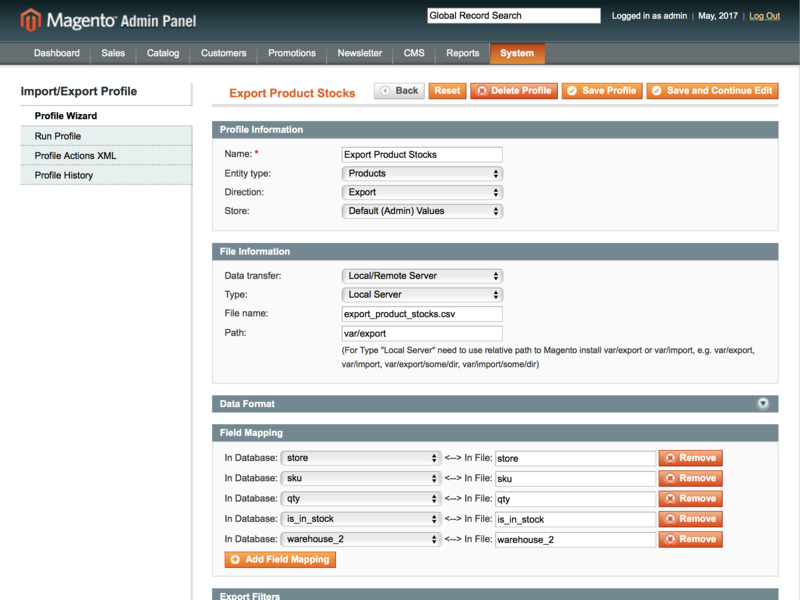 Added compatibility with XTENTO Stock Import Module. Fixed an issue with warehouse editing in orders. Added ability to return stocks to different warehouses based on the order item status: Shipped/Not Shipped. 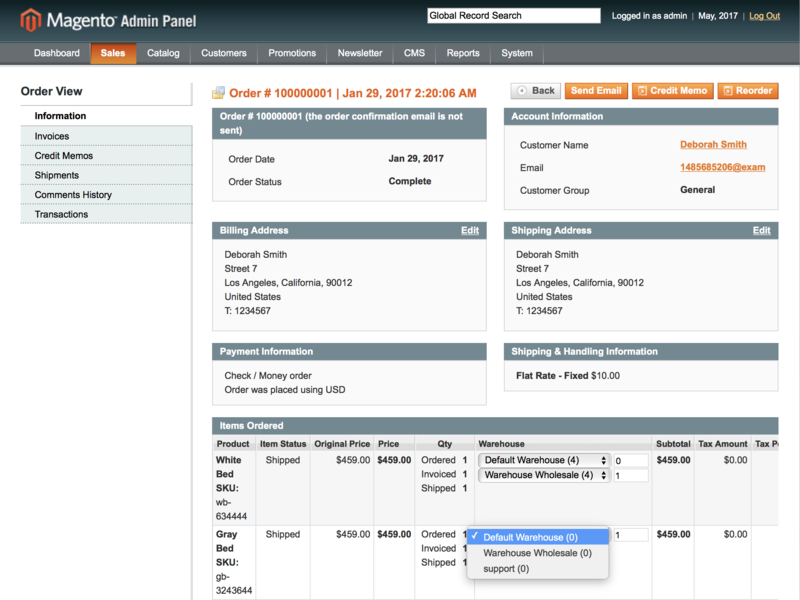 Minor fix to prevent potential conflicts with 3rd-party extensions affecting Orders grid. Added new SOAP API: sales_order.info. Added new REST API: /api/rest/orders. Code improvements related to a strict conditions part. Very scalable module, very fast and very helpful support. Really great to get this working and great support by Andrew. Has really changed the business and made a difference. Good extension working right out of box. My business model requires my products to have more than a single inventory plus specific conditions per website. Having learnt functionality of several multi-warehouse extensions by their demos, I concluded this one was the most suitable. Working capacity is fine and stable. This is essential because I discovered a surprising problem with one of other popular extensions - it consumed all memory and led to a fatal error when I added 5 products to cart.